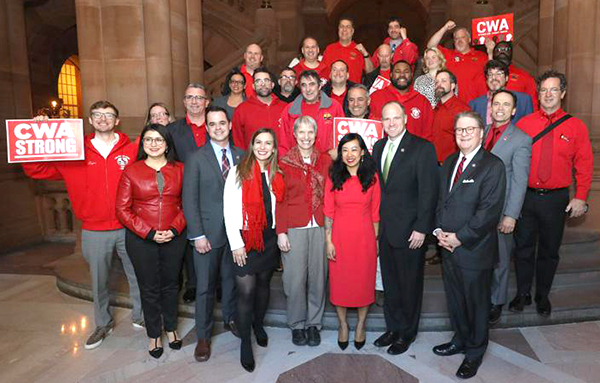 Thanks to years of tireless work by CWA members who made phone calls, sent postcards, met with legislators in Albany, held rallies, and much more, the New York State Senate voted this week by an incredible 58 to 3 count to pass the New York State Call Center Jobs Act to protect call center workers! The bill would require call center employers to notify the Department of Labor if they intend to relocate at least 30% of call volume in a year. Those companies would lose all grants, loans, tax benefits, and state contracts. The bill would also ensure that all state business-related call center work is performed by New York State companies. Next, the New York Assembly must pass the call center legislation and send it to the governor's desk. CWA members in Albany as the New York Senate passed the New York State Call Center Jobs Act to protect call center workers! In the wake of a recent announcement by Conduit Global, which received $2 million in Tennessee state grants in 2014, that the company is laying off 112 call center employees from its call center in Cordova, CWA members' efforts to pass legislation to protect call center jobs are drawing local media attention. "Our tax dollars are going to these companies to bring jobs here and they're keeping the money and then shipping the work out of the country," Misty Robertson, CWA's Tennessee legislative and political coordinator, told Fox13 Memphis.